The first fast ferries, which could make the journey between Wellington and Picton in less than two hours, came into service in the summer of 1994–95. In contrast to the usual speed of ferries in the Sounds (14 knots), fast ferries went up to 40 knots. 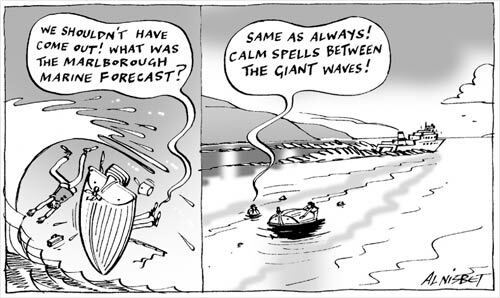 Concern built up over their impact on the beaches and marine environment of Tory Channel and Queen Charlotte Sound, as their speed generated far more turbulence and disruption than the regular ferries – as depicted in this 2005 cartoon. The Marlborough District Council had imposed an 18-knot speed limit on fast ferries in 2000. This limited the viability of the operations, and no ferries with high-speed capability have operated on the route since 2005.